Asparagus is a member of the lily family. The plants take three years of growing before they begin to produce marketable shoots, but the plant is perennial and will last up to 20 years, some say 30 to 50. In spring, on a warm day, you can almost watch the Asparagus grow — a stalk can grow 7 inches (18 cm) in 1 day. When the weather is warm in the spring, a field of asparagus can almost grow faster than it can be harvested. Asparagus prefers sandy soil to grow in. The spears grow from the crown of the plant, about 1 foot (30 cm) underground. The plants are grown in heaped-up, furrowed rows to give this extra depth of soil. There are both male and female Asparagus plants. Both produce spears: in general, female plants grow larger spears and if left to grow, will produce berries with seed. The male plants, because they produce smaller, thinner stalks, are more valued for eating. The male plants also produce more spears, as they don’t have to reserve energy for making seed. Breeding work focusses on increasing the yield of the male plants. If left to grow unharvested, asparagus can grow to be 4 to 6 feet (1.2 to 1.8 metres) tall: the tips of both female and male spears loosen and turn into feathery fronds. If the spears are harvested, the plant will produce ferns, which in turn generate food for the roots so that the plant can grow again next year. Green: like the name says. Most of the asparagus in the UK and North American market is green. Despite the short productive season, the plants must occupy that land for the entire year, meaning that the farmer can’t plant a crop of something else on that land after the Asparagus has finished in the spring. The prime season for buying Asparagus begins in the early spring, when the price plummets. By the beginning of summer, though, your local supply will be drying up, prices will start to increase, and by mid-summer you are back to imported Asparagus and higher prices. You can buy Asparagus fresh, frozen or canned. When buying fresh Asparagus, you want evenly-coloured green stems (lightness towards the bottom probably indicates a pretty tough bit) whose bud-like tips are tightly closed: the more they are open the older the stalks are. In England, Asparagus is graded as — from smallest to largest — Sprue, Choice, Selected, Jumbo and Super Extra Selected. Jumbo is the oldest Asparagus, in terms of how long it was left in the ground to grow. It will have a base that is somewhat white, and sometimes blushes of purple at the tip. In England, the Vale of Evesham and Norfolk are well-known production regions for Asparagus in general. In America, most Asparagus planted is cultivars of the Washington variety of Asparagus. Some people feel that the thinner the asparagus stalks, the better. This isn’t necessarily the case. Thinness won’t be an indicator of taste quality necessarily, and thin stalks can be very easy to overcook. 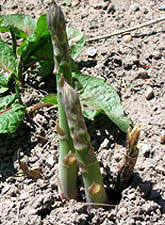 Thicker stalks can be juicier, and better suited to various class asparagus with sauce dishes. In terms of taste for both, the fresher they are, the sweeter they will be. Wash Asparagus well before cooking to remove any grit left from the sandy soil it is usually grown in. Asparagus does not need to be peeled first. Some finicky chefs who want to make other people’s lives miserable would have us do so, but if you have to peel it, you were sold tough, old stalks. The stringy, woody base, though, does have to be removed. Asparagus spears toughen from the bottom up. Once cut, an Asparagus spear will keep growing for a bit from the sugar energy in it. While doing so, it will use its energy to attempt to protect its wounded end by producing fibre under the green skin there, which causes those ends to become stringy and unchewable. 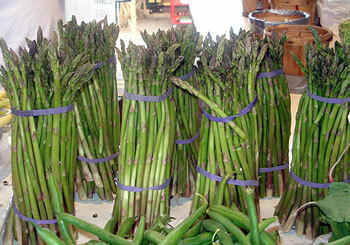 Most of this happens within a day of harvest; the activity also causes the asparagus to become less sweet, as the sugar energy is being used up. The toughening can occur if there’s a delay in chilling the asparagus after cutting of just 4 hours. It can also kick in if the asparagus is allowed to warm back up to 60 F (15 C), such as happens later in stores. So, inevitably, toughening of the ends occurs, and you have to lose part of the end of an asparagus spear. How much is the always the question, balancing waste versus stringy, unchewable wads in your guests’ mouths. Some people guess by eye, and chop off a certain amount with a knife. The more prevalent school of thought is to snap the spears by bending them with your hands one by one: the idea is that a spear should snap right at the point where it starts getting tough. Asparagus is usually boiled or steamed. If boiling, ideally you want a big enough pot that the stalks can lie down in, such as a Dutch oven or a deep frying pan. When the water is boiled, plop in the Asparagus, cover and cook for 3 to 6 minutes. Steaming will take a few minutes longer than boiling, but preserves more nutrients. Whether you have boiled or steamed your Asparagus, when it is done, a knife will slide easily through a stalk. Don’t make it mushy — the stalks should have a slight resistance to the bite without making a crunch that causes your guests to stare at each other. Asparagus is best served warm — rather than piping hot or stone cold — so after you have drained it, cover it, and finish off anything else that needs to get to the table. And remember when testing firmness, that the heat inside the Asparagus will cook it for a few minutes more even after it is drained. Whatever you do, don’t be tempted to add a dash of baking soda to the water to preserve an intense greenness — your stalks will turn mushy and give the appearance of being coated with a slight soap film. If you aren’t planning to serve your Asparagus as stalks, but rather as pieces, Asparagus is generally sliced on a bit of an angle — a French cut — just to make it a little more attractive. When you have time later or the next day, make a quick Asparagus stock from the trimmings. Put a few cups of water in a saucepan (if you boiled the Asparagus to serve, then instead of starting with plain water use that water), toss the trimmings in, and boil for about 15 minutes. Strain out and discard the trimmings, and freeze the water — the flavourful stock will make a great addition to almost any soup. Or, you can use it the next day by puréeing it all, trimmings and stock, then straining and adding some cream for Asparagus soup. Instead of just steaming or boiling Asparagus all the time, try roasting it: toss in olive oil, then roast for 15 minutes at about 400F (200 C), or place under the grill or broiler for about 10 minutes. To barbeque, brush stalks with olive oil and cook on the grill directly over a medium flame for 5 to 10 minutes, turning once. There is no need to blanch the asparagus first. Asparagus stalks that have been blanched, then cooled to room temperature, make great soldiers for dipping into eggs. Just as for corn, Asparagus has its “from plot to pot” fans, who maintain that Asparagus should be cut from the garden and raced to the pot, or at least eaten within hours of being cut. The reason is that Asparagus contains sugars that will start to convert to starch after that, making it less sweet and flavourful. This, however, isn’t very practical advice for the overwhelming majority of Asparagus consumers. High in folate (folic acid), fibre, potassium, thiamin, vitamins B6, A and C. No fat, no cholesterol. To store Asparagus in your fridge, store it upright in a glass that has a few inches (several cm) of water in it — as if you were storing fresh flowers. Or wrap in damp paper towel, then refrigerate inside a plastic bag. Asparagus loses its natural sugar as it ages, so once you get it home you want to use it up within a few days at most. After the blanching time is up, plunge the Asparagus into cold water to cool, drain and pack. The Romans dried Asparagus to be eaten out of season — and rehydrated it by putting it in boiling water for a short time. They would often serve Asparagus with one of their renowned fermented fish sauces. After the Romans and during the Middle Ages, its popularity waned until farmers around Paris took up its cause again in the 1700s. In Italy, cultivation took off in the Piedmont region. It was brought to America by colonists; some garden escapes flourished, and Asparagus can now be found growing in some parts of the North American wild. Folk wisdom in some parts of Britain, as well as France, held that Asparagus should not be cut after Midsummer’s Eve. “Passing one day in February, by the Palais Royal, I paused before the shop of Mme Chevet, the largest dealer in comestibles in Paris, who always wished me well. Seeing a large box of Asparagus, the smallest of which was large as my finger, I asked the price. From: Jean Anthelme Brillat-Savarin in The Physiology of Taste, Project Gutenberg, Apr 2004. First published Dec 1825. McGee, Harold. Asparagus’ Breaking Point. New York Times. 6 May 2009. Page D3. In 2010, a Monell Center research team headed by Marcia Levin Pelchat tested the “smelly pee” problem on 38 test subjects. In this sampling, they found that 8% of the subjects they tested did not produce smelly pee, 6% were unable to smell it, and only one person both did not produce and could not smell it. DNA samples showed that the differences were linked to genetic variations. — Monell Center Press Release. Genetic Differences in Sense of Smell Identified Through Asparagus Urine Odor. 28 September 2010. Wilson, Bee. Supersize vs superskinny asparagus. Can fat asparagus spears really taste as good as thin ones? London: Daily Telegraph. 1 May 2011.